Talk about a day when superstitions collide….Friday the 13th, full moon, and not only a full moon but because of the summer solstice, which occurs next week, the full moon is at its lowest to the horizon for this year, making it a “honey” moon. So called because of the amber color as it rises, this honey moon reached its full phase at 12:13 am this morning, on Friday, June 13. This is a rare occurrence with the last one happening June 13, 1919 and the next one taking place June 13, 2098. For me, and indeed, most people, this is an astronomical first…and last. I am not a superstitious person, so for me, Friday the 13th is not a day to be feared. I believe this day, like any day, is what we make it to be. For many people though, this is a day to stay home. Or, if they have to be out, to be cautious and not make any major decisions. While most of us see Friday as a great day, heralding the approach of the weekend, it used to be considered a day of ill omen. According to Michael Bailey, a history professor at Iowa State University, the day is associated with misfortune because Jesus was crucified on a Friday. In the Middle Ages, weddings were never held on Fridays and it was considered a poor day to begin travels. Friday was also hangman’s day during this time. The number 13 being considered unlucky is rooted in the belief that there were 13 guests present at the Last Supper, with Judas Iscariot, the betrayer, being that 13th person. When Friday and the 13th coincide, culture has long declared that this is the ultimate bad luck day. 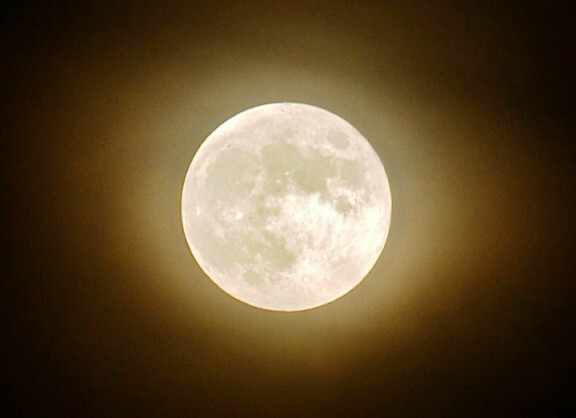 Full moons also receive a bad rap. Our words “lunacy” and “lunatic” both derive from luna, the word for moon. Studies show, though, that a full moon does not cause a rise in crimes, craziness, or childbirth. Our word “honeymoon” may derive from this type of moon as most weddings took place in June in the 1550’s, when this term was first recorded. I love the moon, with her beautiful silvery light. The moon is enchanting, mysterious, ever changing. My birth name, Cynthia, is a Greek name meaning moon. Perhaps it is natural that I would be drawn her. And I have no terror of Fridays or the number 13. Thus, I have been blessed, on this rare day, enjoying family and friends, good food and gorgeous weather, and a lovely stroll through my garden. As tonight’s nearly full moon rises, and Friday the 13th draws to a close, I just might slip barefoot into the backyard and dance in the moonlight on the brick patio. Is that lunacy? I don’t think so. I am grateful, however, for the privacy fence! 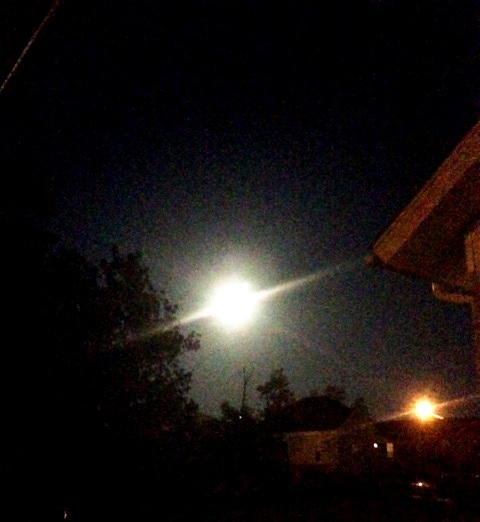 View of the honey moon, from my front deck, early this morning.